Thus it was inevitable that when looking for a third flavour of cupcake for the wedding cakes I made earlier this week, I couldn’t resist the idea of something strawberryish and almondy. Since I’d heard vague rumours of a gluten-intolerant guest, and since I feel terribly guilty whenever I make a cake that is full of eggs and nuts and has wheat flour too, I decided that gluten free strawberry and almond cake was the way to go. (For some reason, a small part of me is convinced that everyone really is allergic to something and that if I use nuts, eggs and wheat flour all at the same time nobody will be able to eat the results. Which is silly, because *I* can certainly eat such things and I know full well that I am not unique in this respect…). About 12-48 rose petals from proper garden roses (you want something with a scent, and that hasn’t been sprayed. If you have the little, old fashioned 5-petal roses, they are fantastic for this – just the right size for a decoration). You will also need a small paintbrush for the roses and a piping bag with a plain nozzle – preferably elongated – for the filling. Wash and hull the strawberries and chop them into small chunks (about 1cm). Set aside a handful for the filling. Yes, I know that isn’t very precise, but it still works. Preheat the oven to 180°C and line twelve muffin tins with paper cases. Cream the butter with the raw caster sugar, then beat in the eggs. Stir in the rice flour and almond meal with the baking powder, and when the batter is completely combined, fold in the strawberries. Spoon into the patty cases and bake for about 20 – 25 minutes. Let cool on a cake rack before filling and icing. Pulverise your pistachios or you will never be able to pipe them. You can probably do without them if you are anti-pistachio, or you could use almonds again – maybe more finely ground ones, for contrast. Put the pistachios in a food processor with the strawberries you set aside, the cream cheese and a tablespoon of sugar. Blitz until very smooth (and a lurid shade of pink, I might add), and put into a piping bag with a long, plain nozzle. Actually, I used an ordinary plain nozzle, as it was clear to me the cakes were quite moist and crumbly and weren’t going to co-operate anyway. Stick the nozzle into the centre of the cake and pipe a little of the filling in. Be circumspect – the cakes will puff up when they are done, and it’s a very, very narrow line between ‘puffed up’ and ‘exploded’. I think we all know which side of the line we want to be on. Every single one of my cakes ended up just a tad on the wrong side of that line. Thank heavens for icing! Refrigerate the cakes until you are ready to decorate them. 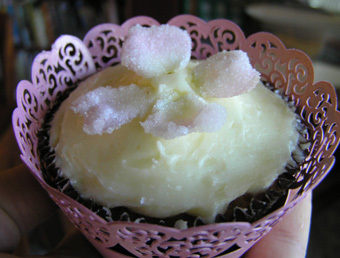 Spread with cream cheese icing, and decorate with crystallised rose petals. Beat the butter with the cream cheese until soft. Sift in the icing sugar, beating as you go, until you get a good spreading consistency. Carefully remove the petals from your roses, and wash them well. You can get some really tiny insects on roses, and you don’t really want candied aphids or anything like that. Pat them with paper towels and let them dry completely (but don’t leave them out for days and days or they will wither). Beat the egg white very gently in a small bowl, just to stop it from being a single jelly-entity. Pour the caster sugar into another bowl. Using a small paintbrush, paint each petal carefully on both sides with eggwhite, then dip it into the sugar on both sides, making sure it is thoroughly coated. I dropped each petal into the sugar bowl, tossed sugar over it with a spoon, then shook it off. And then checked that it really was coated. Let dry on a tray covered with greaseproof paper. The petals should actually be almost crunchy when dried. You can also do this with violets, nasturtiums, and some edible herb flowers. Not so much the orange blossoms, alas. Also do note that while it seems like a very clever idea to crystallise whole flowers, the stamens are not really open to this idea – they seem to harbour a lot of moisture and will leach this out onto the petals if you are not careful. I’m not sure if there is a way around this, but that’s what happened when I tried it, and it ruined an entire batch. Well, you could always try the original recipe. Or even the recipe that Odile based her version of the recipe on… Odile’s version is almost certainly more structurally sound than mine. In terms of flavour, I would think this would work with just about any berry or any nut meal. More pistachios might be awesome. Ooh, or what about a pistachio-meal cake with apricots through it? Slightly reconstituted dried apricots would probably work best for this. And then you could use a little orange flower water in your icing or filling or in the batter. Yum. This recipe is already gluten-free, of course, and Odile’s version is low in lactose (though not dairy free). I think you could make a pretty good dairy-free version of this using Nuttelex margarine for the butter and Tofutti mock cream cheese for the filling, which has enough flavour to mask Tofutti’s blandness. And, actually, the soy flavour in the background of the Tofutti would probably go very well with the flavour of the nuts. I would try to do something different for the icing though – maybe a basic glacé icing (icing sugar with a dab of margarine and some soy or rice milk) flavoured with almond essence, strawberries, or lemon. Egg-free would be trickier, I think. There is no obvious egg substitute that wouldn’t mess with the flavour, and I think there might be too much egg to substitute readily. Maybe apple sauce? I don’t know that this one would work. Nut-free is sort of defeating the purpose, but I’m sure you could do it – quinoa flour would probably give a pleasing nuttiness to the recipe. I wonder what it would taste like with 3 parts rice flour and one part besan (chickpea) flour? This recipe will never be low-GI (though there are certainly worse options out there) or low-fructose. ← Show-off post: Wedding Cake! cate, so happy to hear that it worked out well for you, and thank you for the plug 🙂 I really enjoyed reading through your version of the recipe (it’s great, the thing keeps changing, by the time it’s made its rounds it’ll be a full-gluten, full-fat affair…) and look forward to now perusing the rest of your blog! Thank *you* for the recipe! The cakes were very popular at the wedding. I love the way recipes evolve depending on the needs of the people writing them – I have so many friends with different dietary requirements so I’m constantly adapting recipes in different ways. Though it was a pleasant change being able to adapt a recipe to give it *more* fat and lactose – but wedding cakes deserve a bit of decadence about them. Thank you! And yes, let’s lay particular emphasis on keeping the rose flavour subtle – I’ve ruined several recipes by getting carried away with rosewater or orange flower water. They are definitely not flavours to mess with. Incidentally, I just made your cherry and chocolate and almond cake again (double quantities) – the first batch disappeared way too fast, but this time I’m planning to freeze a batch so that I’ll have it later in the week when things get really crazy. That crystallized petal is a sure hit! I am excited to make one! Thanks for sharing that awesome technique.